The protest is now officially the hallmark of Aam Aadmi Party ever since it came to the power. The party itself has been born from the Anti-Corruption Protest 2011 led by Anna Hazare, against the Centre Government of India aka Indian National Congress, support for which poured in from across the country. In last 4 days, in New Delhi, a drama of protest has been going on at LG's House 'Raj Niwas'. The people of the capital are suffering between the 'illogical and unexplained' protest of Delhi's Chief Minister, Shri Arvind Kejriwal and the Central Government of India. This has been the well-thought strategy of AAP to distract the people from the failures of the government. The National Capital has already been facing water-crisis. The Supreme Court, on the other hand, has called the problem "semi-critical". Now Delhi's CM protest has been totally ignored by the people of the city. The people themselves are unaware of reason "Why Mr. Arvind Kejriwal is protesting?". Many times Delhi's CM himself claimed that "We are not like other parties who are best at creating the mockery of the Constitution". But now the things and Aam Aadmi Party is looking similar to other national parties in the country. Congress Government, under the leadership of Smt. Sheila Dixit for 15 years worked under the same constitutional framework, with the same power distribution and won six consecutive elections between 1998 and 2013. 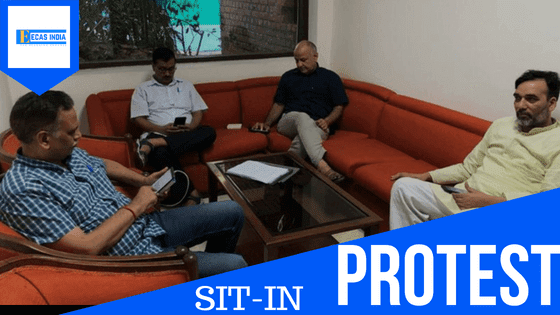 Accompanying the Raj Niwas sit-in protest of Chief Minister Arvind Kejriwal are the Deputy-CM Manish Sisodia, Home Minister Satendra Jain, and Rural Development Minister Gopal Rai, whereas many AAP leaders have been protesting outside the LG's House 'Raj Niwas'. 8 Likes, 1 Comments - 🇮🇳indians 🇮🇳 (@we__luv__india) on Instagram: "Bilkul sahi baat 😅 Follow us @we__luv__india @we__luv__india @we__luv__india @we__luv__india..."
But an elected government is not voted to power to sit in protest. It must use its authority, where it can; it must reach out to opponents, where it can't. Protests got AAP to power. But continuing in protest mode might ensure it is finally thrown out of power.